Contributed photo Richmond's 4x200m relay team broke a 31-year old school record at New Century last week. 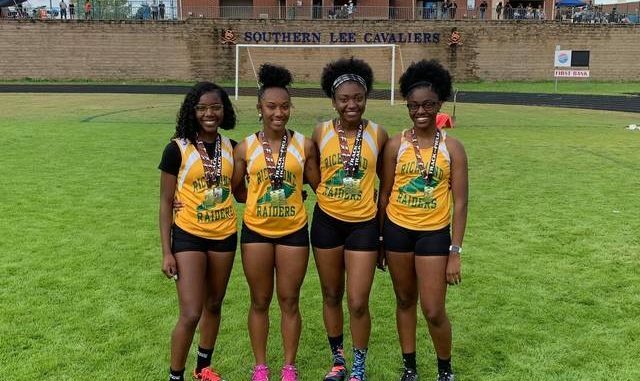 FAYETTEVILLE — Maddisyn Diggs, Monasia Kearns, Dymond McNeal and Bree Wall ran their way into the Richmond girls track and field program’s record book during a Sandhills Athletic Conference meet at New Century last week. The junior quartet made up the 4×200-meter relay team that broke a 31-year old school record with a time of 1:40.60 seconds, which won the event convincingly and beat the old record (1:42.85) by a little more than two seconds. It was the highlight of the Lady Raiders’ most dominant effort this season, as they tallied 130 points in last Thursday’s conference meet in order to take first place over Jack Britt (48 points), Pinecrest (41) and rival Scotland (37). Jakerra Covington, a sophomore, almost joined in on the record-breaking party by clearing the five-foot, six-inch bar in the high jump — which was good enough to tie the school record. She also won the 100m dash with a time of 12.6 seconds. 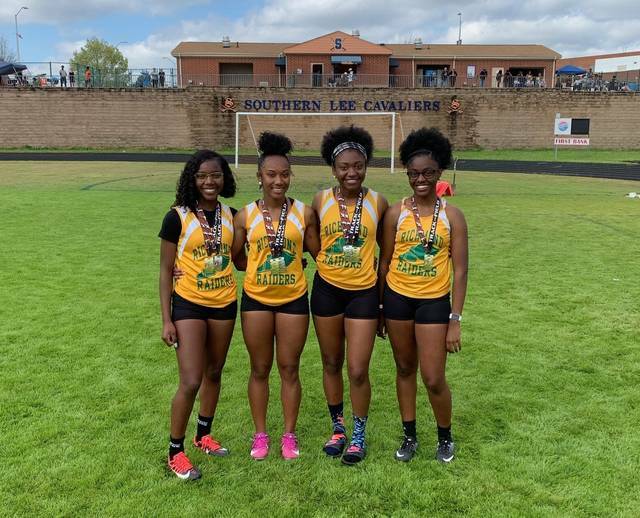 Richmond’s girls also got winning individual finishes from junior Kibreanna Stewart in the 100m hurdles, junior Allexis Swiney in the long jump, junior Sierra Ramsay in the 400m dash and junior Jardai Tillman in the shot put. The Lady Raiders’ 4×1 and 4×4 relay teams also bested their respective competition. FAYETTEVILLE — Although there were no broken records on the other side, the Richmond boys track and field team did win two events — one individual, one group — on its way to a third-place finish at New Century last Thursday. Christopher Quick Jr. cleared six feet to take first in the high jump and the 4x200m relay team (Jaron Coleman, Taveon Ellerbe, Justin Morman and Xavion Lindsey, respectively) worked together to finish with a winning time of 1:35.40. Both victories helped the Raiders bring in 12 of their 48 points on the day. Right behind Quick, a senior, in a three-way tie for second in the high jump — all maxing out at five feet, 10 inches — were fellow Raiders sophomore Caleb Hood, junior Antron Miller and senior Xavier Pettigrew. Also finishing second for Richmond were a couple of sophomores in Jakolbe Baldwin and Trevor Moss. Baldwin measured out at 19 feet, one inch in the long jump while Moss crossed the finish line at 54.6 seconds in the 400m dash. Baldwin was also a member of the Raiders’ 4x100m relay team that placed second. Richmond’s 4x200m relay team broke a 31-year old school record at New Century last week. Reach sports editor Leon Hargrove Jr. by phone at 910-817-2673 or by email at [email protected] For stories, scores and updates, follow the Daily Journal’s sports section on Twitter @RCDailySports.